Ruth is a member of the Chartered Society of Physiotherapists and the Health & Care Professionals Council. 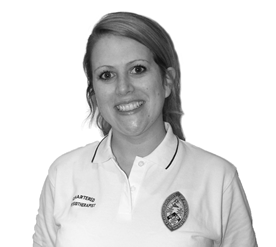 Ruth began her Physiotherapy training in 2009 and graduated from the University of Plymouth in 2013. Ruth’s training had an emphasis on evidence-based practice which she continues to integrate into her practice. During her training Ruth gained experience working within various areas in the NHS including Intensive Care, Cardiorespiratory, Neurological Rehabilitation and Elderly Care. Ruth soon decided she had a special interest in Neuromusculoskeletal Physiotherapy and she especially enjoyed her experience working within Trauma & Orthopaedics, Fracture Clinics and Musculoskeletal Outpatients teams in the NHS and was involved in running knee rehabilitation and cardiac rehabilitation classes during her training. Ruth has attended post graduate courses in Tendinopathy and Sports Massage and is committed to continuing her professional development by actively attending courses and researching current concepts and evidence. Ruth has a friendly and caring personality and she is dedicated to building strong professional and therapeutic relationships with her patients.